Home Engine & Upkeep DIY Quick, Get Back in the Boat! Installing a boarding ladder? If you’re an avid cruiser, you’ll need one! 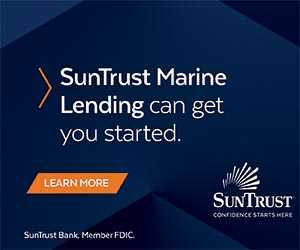 Spend time at any yacht club tiki bar and you’re bound to hear the tale of a cruising couple, an impulsive mid-ocean swim, the inability to climb back on board, and the telltale fingernail marks found later on the transom of the unmanned vessel. In an effort to keep you from becoming the fodder of such sea stories, here’s the scoop on choosing and installing a boarding ladder on your vessel so that you can safely enter and exit the water from the deck or swim platform. Boarding ladders also make it easier to board a dinghy and assist in retrieval of personnel in a crew overboard (COB) situation in calmer waters. Boarding ladders should be constructed from non-corroding materials such as plastic, aluminum or stainless steel. Aluminum ladders weigh less and are cheaper, whereas stainless steel ladders are stronger and more durable. Boarding ladders can be fixed or portable and come in a variety of styles. However, for the purpose of this article, we’ll concentrate on three types: Swim step ladders, transom ladders and removable ladders. These are typically mounted to a power boat’s swim platform. However, installation of a swim platform ladder is an option for smaller vessels (those powered by outboards or I/O drives, for example) that typically don’t have space for a full transom platform. 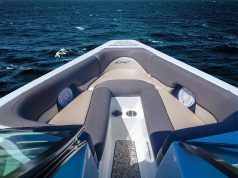 Due to their proximity to the water, both units normally require no more than three steps to meet the American Boat and Yacht Council (ABYC) requirement regarding extension into the water. When not in use the ladders can either fold up onto the swim platform itself or telescope out of the way underneath. 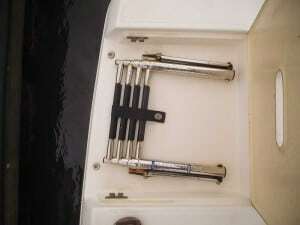 These are hinged units typically found on sailboats. Many ladders are constructed so that they become an integral part of the stern railing or pushpit when raised and secured in place. When lowered, they provide an opening in the stern railing and a means of entering and exiting the water. Transom ladders designed as part of the stern pulpit are generally factory installations, but aftermarket units can often be easily installed depending on the vessel’s transom configuration. These units, as opposed to portable ladders, are attached using permanently mounted brackets. These brackets are typically bolted to the gunwales or deck of a vessel and utilize keyhole slots, cotter pins or some similar arrangement that allow them to be easily installed and removed when not in use. Some units are rigid one-piece units, while others are hinged so that they can be folded up rather than removed when not in use. Others still are telescoping or even accordion-style units, which can be adjusted to facilitate boarding a dinghy or fully extended for water entry or exit. ABYC standards state that all boats must have a means of unassisted re-boarding that must be accessible to and deployable by a person in the water. 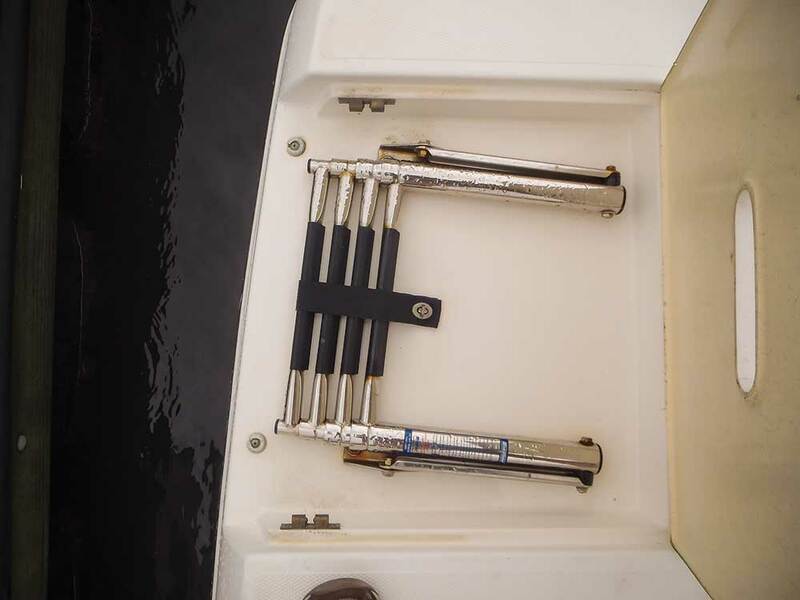 ABYC also calls for each boarding ladder to be able to withstand a vertical downward static load of 400 pounds without permanent deformation in excess of 1/4 inch, and for the top surface of the lowest step to be at least 12 inches below the waterline with the boat in a static floating position. In general, ladders should be located at a spot that makes the vessel easy to board such as the side of a sailboat adjacent to the lifeline. If the ladders are mounted on the stern, they should be installed as far as practical from the propellers. As with any project, the first step is to thoroughly read and understand the manufacturer’s instructions. Next, visualize the installation and do a “dry run” in order to identify and address potential problems beforehand. Does the location you’ve chosen for the ladder meet manufacturer and ABYC recommendations? Are the mounting hardware and backing plates sufficiently robust, and can they be reached on both sides for tightening? Ladder installation on a swim platform is typically a straightforward affair. 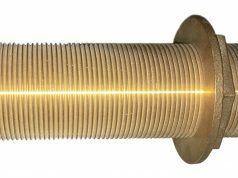 For installations that require drilling into the hull, always verify what’s on the other side before drilling in order to avoid collateral damage to equipment, wire runs or Aunt Martha’s picture. 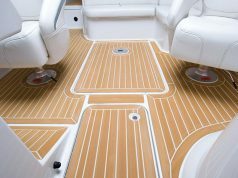 You’ll also want to ensure all mounting hardware is properly bedded with a suitable marine-grade sealant, and that when holes are drilled through any cored portions of the hull or deck, the exposed coring is properly sealed to prevent moisture entry. Even when properly installed, some of the above ladders may fail to meet the ABYC requirement for easy deployment by a person in the water, particularly those that should be removed and stowed while underway. One possible solution is the installation of an emergency boarding ladder. 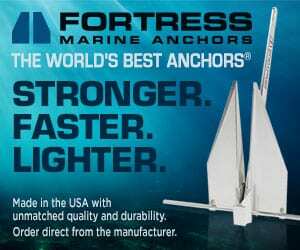 These units, typically some form of rope ladder utilizing rigid steps, are collapsible, lightweight and can be easily installed on most boats. Most are stored in a canvas bag and deployed by a grab rope hanging just above the waterline. Rope ladders are convenient emergency ladders due to their compactness and flexibility. However, they’re harder to climb than rigid units, making them less than ideal as primary boarding ladders. If installed, it’s always a good idea to test deployment and ease of use in calm waters before they’re actually needed. One trick that can make them easier to board is weighting the lowest rung of the ladder to ensure it fully extends when deployed. Finally, while many cruisers likely plan on using their boarding ladders during a COB recovery situation, preparation should include various scenarios such as recovery of an incapacitated victim. It’s crucial that COB and recovery drills are not only understood by all on board but also practiced on a regular basis. They should also include captain and crew role reversals, to ensure recovery can take place if the captain or crew is incapacitated.